Information and recollections about Armed Forces Network Taiwan and Armed Forces Press, Radio, and TV Service, NY in the mid 1960's. 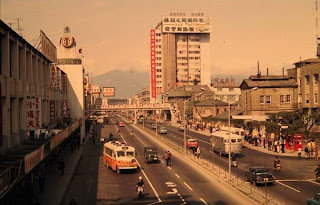 AFNT was located downtown in the West Gate area of Taipei in the Sugar Building across the street from the First Department Store (tall building on the right). Thanks to Rick Courtney for the picture and the aircheck of "China Night" from Frank Feller (on the right hand side of the page). Rick's blog is here.